Higher education is considered as an essential element for the empowerment of the individuals and societies. Social dimension, as part of such process, has the potential to promote equality, fairness and inclusion in higher education, considering such action is focused in the equity and wellbeing concepts, also in the framework of the EHEA. The Ministers also agreed to develop a common understanding of the concept of social dimension within the BFUG. As such the Ministers agreed to develop proposed principles and guidelines for the social dimension of HE within the EHEA and to have them submitted to the 2020 Ministerial Conference for adoption, through the BFUG. Other objectives agreed at the Paris Ministerial Conference aim at gathering and examining of the data on good practices in the area of social dimension, drawing on previously agreed commitments and existing data, exploring the scope of the EHEA cooperation to strengthen the social dimension of HE as well as start working on Peer Learning Activities within the Social Dimension area. "Making our systems more inclusive is an essential aim for the EHEA as our populations become more and more diversified, also due to immigration and demographic changes." They also agreed to undertake to widen participation in higher education and support institutions that provide relevant learning activities in appropriate contexts for different types of learners, including lifelong learning. They will improve permeability and articulation between different education sectors. They will enhance the social dimension of higher education, improve gender balance and widen opportunities for access and completion, including international mobility, for students from disadvantaged backgrounds. They will provide mobility opportunities for students and staff from conflict areas, while working to make it possible for them to return home once conditions allow. They also wish to promote the mobility of teacher education students in view of the important role they will play in educating future generations of Europeans. Finally, ministers approuved the Working Group on Social Dimension and Lifelong Learning report and commit to make the higher education more socially inclusive by implementing the EHEA social dimension strategy. "[t]he student body entering and graduating from higher education institutions should reflect the diversity of Europe’s populations"
This goal had been formulated for the first time at the London summit of 2007, where ministers had also stressed "the importance of students being able to complete their studies without obstacles related to their social and economic background", after the social dimension had entered the Bologna Process with the Prague Communiqué in 2001 and gained importance in subsequent years. To further this goal, ministers at their meeting in Bucharest in 2012 agreed "to adopt national measures for widening overall access to quality higher education" and to "work to raise completion rates and ensure timely progression in higher education". More specifically, they agreed to "step up [their] efforts towards underrepresented groups to develop the social dimension of higher education, reduce inequalities and provide adequate student support services, counseling and guidance, flexible learning paths and alternative access routes, including recognition of prior learning". They also encouraged peer learning on the social dimension and endeavored "to monitor progress in this area". The PL4SD (peer learning for the social dimension) project, which seeks to support policy-makers and practitioners in developing effective measures for improving the social dimension of the EHEA, was one of the main response to the ministerial wish. The European Higher Education Area in 2015: Bologna Process Implementation Report is an important contribution to the monitoring of the social dimension progress in the area. In its 2012-2015 work programme, the Bologna Follow-Up Group (BFUG) decided to establish a Social Dimension and Lifelong Learning Working Group (SD&LLL WG). The social dimension plays an important role in enhancing the attractiveness and competitiveness of the European Higher Education Area (EHEA). The EHEA aims to widen overall access and increase participation and completion of underrepresented groups in higher education, according to the diversity of the national populations. In its turn, widening access to quality higher education is viewed as a precondition for societal progress and economic development. Akin to the social dimension, lifelong learning is accredited for its aim to provide learning opportunities for more diverse student population. The social dimension and lifelong learning are interwoven themes that share such central issues as the provision of appropriate education support, guidance and counseling, student-centred learning, and recognition of prior learning. In the context of the EHEA, access and equity are critical to lifelong learning, and lifelong learning itself is critical to advancing the social dimension of higher education in its integrity. Taking into account the interlinkages between the two policy areas, in its 2012-2015 work programme the BFUG decided to establish a single Social Dimension and Lifelong Learning Working Group (SD&LLL WG). The Report of the 2012-2015 BFUG Working Group on the Social Dimension and Lifelong Learning, technical in its essence, is prepared by the members of the 2012- 2015 BFUG Working Group on the Social Dimension and Lifelong Learning (SD&LLL WG) and details the work carried out in the period. The report starts with a brief historical overview of the social dimension and lifelong learning in the Bologna Process, then turns to the synergies and areas of complementarity between the social dimension and lifelong learning in the European Higher Education Area (EHEA). Furthermore, SD&LLL WG’s mandate and membership as well as the achievement of the WG’s action plan are introduced. This section also includes the inputs from the four thematic groups (TGs) established under the WG to take further the goals identified in the action plan. In addition, the document provides a report of activities of the Peer Learning for the Social Dimension (PL4SD) project as of November 2014 and puts forward proposals for its future. to endorse Widening Participation for Equity and Growth - A Strategy for the Development of the Social Dimension and Lifelong Learning in the European Higher Education Area to 2020 to support the EHEA countries in the development of a coherent set of policy measures and effective national plans or strategies to ensure greater access to quality higher education for non-traditional learners and students from disadvantaged backgrounds. to endorse the work of the PL4SD initiative to date through its database and conferences, to note the imminent publication of the initial three peer reviews of EHEA member countries and to support the continuation of the PL4SD initiative beyond September 2015. Effective Approaches to Enhancing the Social Dimension of Higher Education presents the main outcomes of a partnership of organizations working towards improving the equity of Higher Education systems across Europe in the period 2013-2016. The consortium consists of the Tavistock Institute for Human Relations (United Kingdom), the European Student Union (Belgium), ECHO (Netherlands), EURASHE (Belgium) and the Knowledge Innovation Centre (Malta). The presented publication is the work of a concerted effort from these partners to synthesise the results of the project. 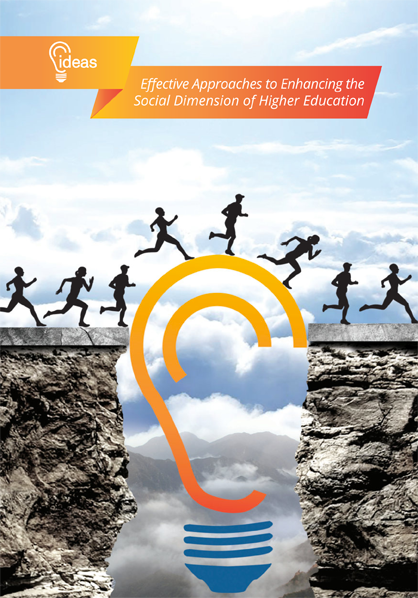 By identifying effective and efficient approaches to improve the social dimension in higher education, the IDEAS Project final report presents examples of good practice with proven quantitative and qualitative successes. In the report, which brings together the entire work of the project over the last 2.5 years, the partners provide the necessary data and frameworks of tested experience to inspire (higher) education institutions in particular, other stakeholders like governments (local & national) and foundations to translate, implement and replicate.